Following our tour around Savile Row tailor Dege & Skinner a few weeks ago, I decided to commission a suit from cutter Nicholas De’ath - a tobacco number in W Bill’s 11-ounce linen. This is the second fitting. Regular readers will note that it is similar to the suit I had made two years ago by Spanish tailor Langa. Unfortunately this new linen is not in addition to that suit, but to replace it. Although I loved the style of that Langa suit – primarily its lapels and the colour of the linen – it always had problems with the sleevehead, which cutter Joaquin tried to convert from a regular structure to a shirt-shoulder at the last minute. It was never quite right, and still isn't despite an attempt at remedial work by Graham Browne here in London. Russell at GB also attempted to rescue my green-cotton suit by Spanish tailor Reillo, but equally could not rectify its issues – with the structure of the shoulder itself this time. Shoulders are tricky things, and not easy to change without remaking the entire jacket. Still, both suits were cheap and I’m sure there is value in providing reviews of them for Permanent Style. Plus they both have lovely trousers that I will continue to use. With this new commission from Dege, I decided to go for a heavier linen, 11 ounce (the last one being an 8-ounce from Scabal, number 801490). Although the lighter linen did rumple nicely, I find I prefer this W Bill range (the same Terry Haste cut for me four years ago). It is cooler, despite being heavier, and definitely more elegant. The suit is single-breasted, with two buttons and cuffed trousers. After a bit of wrangling I convinced Nick to cut the jacket about half an inch shorter than he would normally – which is still a good deal longer than the Italians. It will also have patch hip pockets (and a normal welt outbreast pocket). We agreed that we generally dislike the large, square patch pockets cut by most English tailors, which are too clearly designed for stuffing rabbits into. These are a touch smaller and more rounded as a result. The trousers will also be interesting. Nick largely cuts braced or high-waisted trousers, but I rarely wear braces (a bigger discussion that regular readers will be aware of) and trousers can be high in the back on me (given my hollow back) but struggle if high in the front. In the images here they are obviously too long, and are being taken up. But how they finally sit with a relatively straight top we will have to wait and see. Hopefully it will be a big improvement on the Langa it will replace. You can follow the discussion on Dege & Skinner tobacco linen suit by entering your email address in the box below. You will then receive an email every time a new comment is added. These will also contain a link to a page where you can stop the alerts, and remove all of your related data from the site. A very nice suit. Will the jacket be fully lined? Only a few weeks ago I got my linen jacket ready from my tailor. It is DB made from cabals pure linen #802250. A wonderfull blue in 250gramms. I only had a jacket made which I plan to combine with white or red chinos and wearing a white panama hat. I think it is a perfect summer outfit. Good choice when it comes to the weight. I have an 11oz single breasted blue from A&S and I absolutely love it. I had the same pocket style but I steered clear of trouser cuffs. For me, they just don’t look right on linen. It’s interesting because I was discussing this very cloth with Russell the other day, and we decided that unless you were going to be spending a lot of time in sunnier climes, there would not be many occasions where it would fit well in the UK. (Think white linen short, espresso suede loafers, no socks……). I have been a fan of Dege for a long time and have found them always welcoming, so thank you for this article. Looking back on the two commissions that went awry was this due to Cutter error or confusion re. which shoulder head style would be best. Good also to see the Fosters, I followed your excellent article (unlike any other journalist I can think of in fashion/apparel you were completely honest re. results) and now wonder how are they bedding in? How wide are the bottom of the trousers in cm? Looking forward to the finished piece! About the cloth, it appears to have a touch of red or gold undertones, something normally associated with the tobacco colour. Also, is it possibly a hint lighter? How would that affect its versatility, to wear it as separates? Do you find that most tailors you use complete the trousers at an earlier fitting to the rest of your suit, mine typically one before? Will you keep the old langa as a beater jacket or what? It seems somewhat antithetical to commission such a casual suit from a tailor known for a highly structured house style inspired by its military heritage. What was the thought process behind this project and is it ever worth asking a tailor to deviate so significantly from their house style? Thanks Matt. Neither Dege nor I considered this a deviation from their house style – although the cloth is more casual, the structure makes it far more formal, suited to a shirt and tie etc. That is how I will wear it, and it’s something Dege make fairly regularly along with similar Row tailors. I have similar experience. Demanding Neapolitan tailoring from a British tailor and demanding British tailoring from a Neapolitan tailor is not really a good idea. I ordered a pea coat similar to the pea coat made by Davide Taub for Simon at a Neapolitan tailor. I got a nice pea coat. Very happy with it. 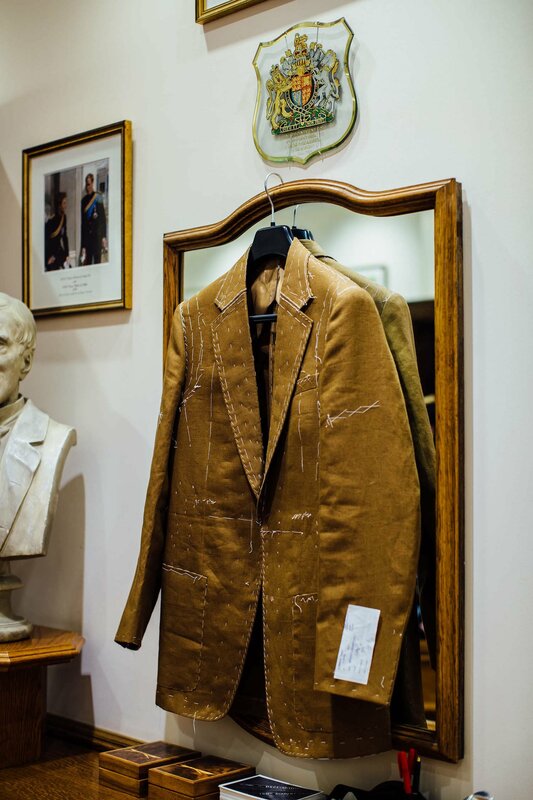 But the tailor had real difficulties with the storm collar and refused making the curved seams on the back (I have seen such curved seams at the backs of different overcoats made by Savile Row tailors, but it seems that in Naples they are pretty uncommon ). The same way I suppose Savile Row tailors would not be happy to so some very light structured techniques used by the Italians. I would say, that it is generally a good idea to order at a tailor garments which would be appropriate for the climate where the tailor lives. Naples for summer clothes and Milan/London for winter/3-season clothes is in my experience a good working strategy, because the technique of the tailor has evolved over time to suit the climate where he lives. For example I don’t really like unstructured winter overcoats as made by some Neapolitan tailors. Sweater like overcoats are not as elegant as structured overcoats. At the same time in summer you will be more elegant wearing a Neapolitan unstructured jacket than wearing a shirt and a structured British jacket in your arm (because it is too warm to wear it). I agree completely that you should not ask a tailor to change his house style. It reminds me of a story about the legendary Dougie Hayward. Evidently, in the ’80s, a yuppie went into his shop and asked if he could do him a suit like Giorgio Armani ? He famously replied; ” No I can’t but why don’t you f**K O** down the road and ask Armani if he can cut you one like Dougie Hayward. What is the nr of the fabric? Two unrelated queries if I may. I am looking to buy or have made a pair of formal trousers to be used with a separate jacket. The other day I called in at Anderson and Shepard and tried on a pair of their ready to wear trouser which just required finishing i.e. the cuffs. Whilst I liked them they felt a little wide. I went subsequently to my usual tailor ( Tim Everest ) to discuss having a pair made. As I wanted them lightweight but able to hold a crease well the cutter suggested Fresco – do you have any experience with this material. 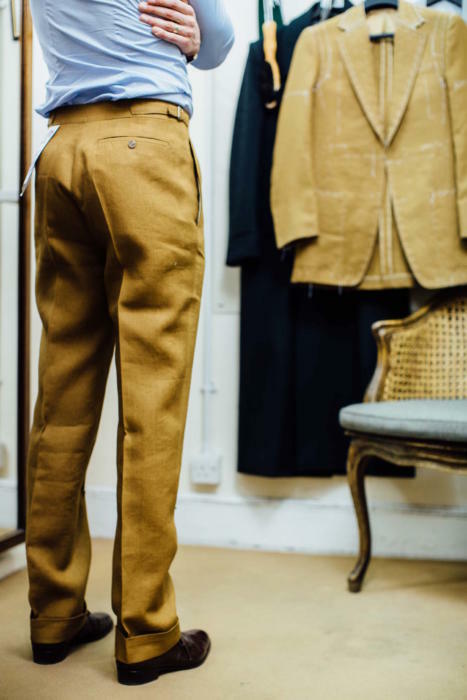 Also he offered to re cut the A&S trousers if I bought them instead and didn’t seem to think that bespoke trousers held that much value for me ( compared to say a bespoke blazer ) do to my regular shape. I haven’t come across this sort of offer before. You said you would keep the trousers as odd ones, to be worn with what jackets/knitwear and in what contexts? Specifically the brown linen. Hi Simon, Is it WB60154? I like this a lot Simon. The colour is great. I have some tobacco brown Fresco from the Die Workwear order last year which I have yet to have made up. I think this linen’s lighter and yellower tones will work better for your summer palette. I think I saw your Langa jacket hanging up in GB recently. Certainly the shoulder did not look quite right. in the article it seems you’ve had to write off two suits where the garment wasn’t made to your liking and the error rested on the tailor’s side and not yours. what can you do if the tailor isn’t able to resolve these issues completely? is there some protocol where the tailor will redo for nothing, or perhaps for a smaller charge so that both parties are happy with the end outcome? cheers. Of course you can’t have something changed endlessly for free, but if it is clearly wrong, you can simply say so. Then the debate changes to start again, or give me my money back. Over the 35 or so years I have been commissioning bespoke, this has been a conversation I have had three times, and the outcome has always been positive. Have you selected the buttons yet? How dark a brown/tan are you going? Horn or something else? Any chance of a picture in natural light, to see the colour better? Hi Simon, how does Dege’s house style differ from that of Huntsman? If I’m looking for something with a strong roped shoulder, lots of waist suppression and a very tapered fit (like Thom Sweeney) on the row, should I go with Huntsman or a militaristic tailor like Dege or Henry Poole? its funny but I don’t think huntsman actually do a strong shoulder relative to some of the other English tailors, yes, compared to the Italians and A&S its a strong shoulder but not like Dege. Also, the huntsman silhouette has changed massively in several iterations lastly one previous to the takeover where the whole look was toned down IMO to more of a one button poole look (the chest isn’t as lean, the coat isn’t as long). Simon is right that all could do what you want as you are generally in the confines of the house style, I would make sure you get on with the tailor though, that he is prepared to listen to you and make adjustments beyond the ascribed number of fittings if necessary. 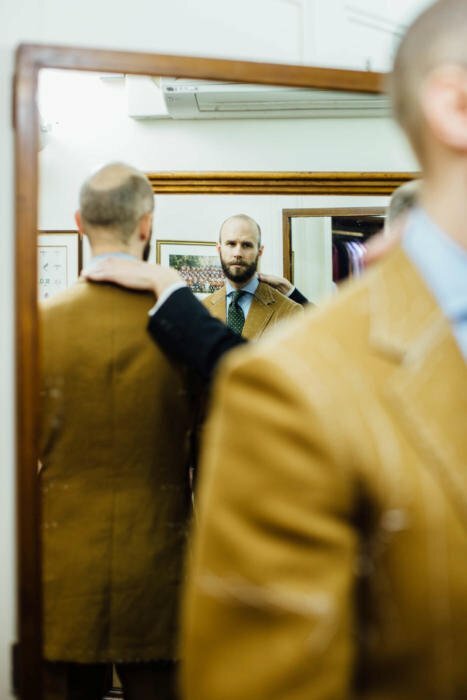 Simon probably doesn’t have any issues with snarky tailors as he writes this blog, but as a small customer at a couple of places I’ve had some issues where I felt like I wasn’t treated very well (English tailors on and off the row). Rups – Interesting comment. I have had exactly the same experience on one occasion re having the feeling of not being treated well. I love your blog Simon but I do fear that one area where it is probably not very useful is in giving information on attitude and customer service. 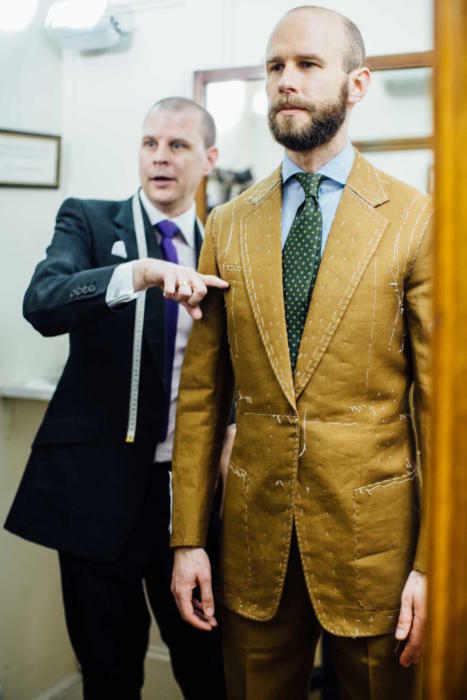 Knowing that you have this site, I suspect some tailors give you a whole different level of attentive service compared to a walk-in customer (who isn’t a celebrity or oligarch) might get. I’ve had one very famous Savile Row tailor give me a basted fitting on my first garment, i.e. developing the pattern, at which we discussed some things I wanted to look at in the next fitting. 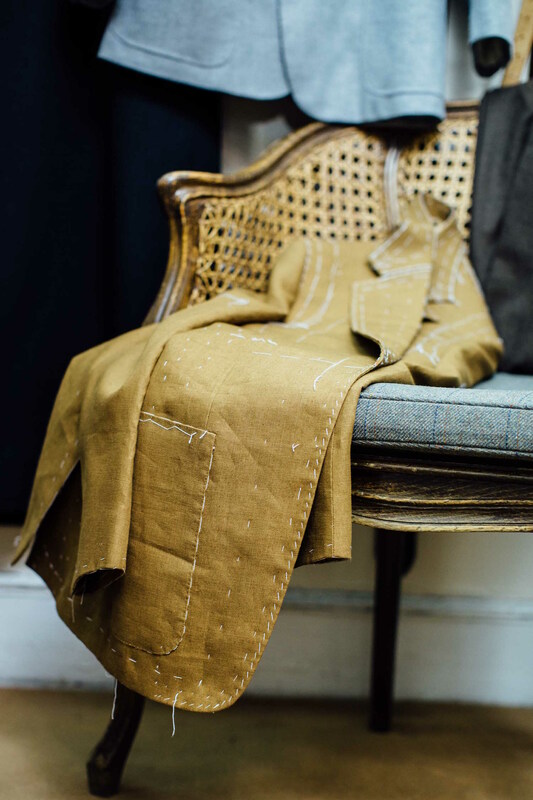 A month or two later I was called in for the next fitting, or so I thought, only to discover on arrival that they had gone straight to finish so things like buttoning point (my biggest concern during the baste) was no longer adjustable. In retrospect I should have asked for my money back or insisted that they re-order the cloth and start again. At the time that seemed a bit excessive for a 1 or 2cm drop of the buttoning point on what was otherwise a really nice jacket but now I’m annoyed I didn’t do it as a matter of principle. The crazy thing is that I’m considering going back to that tailor for another jacket but this time I’m not putting up with any lack of service from them. I’m not sure if that’s a good idea or not but I’m now getting tired of flitting between tailors trying to find the perfect one that I want to stick with. None have been perfect but I think this one is the best make and style so maybe working on the relationship might be the thing to do. Interesting story and point Julian. To be honest, I’m usually surprised that tailors don’t treat me any differently. That they experience can still be so obviously not smoothed over and well-presented, even if they know it’s going to be written about. Perhaps a bit frustrating for me, but much better for the reliability of the blog. Thanks Simon. Point taken, your bad experiences are faithfully recounted and are useful but you can’t always know if the tailor who just fawned all over you because of your web site might have been a grumpy snarky awkward git to the next person through the door. Re my experience, am I being crazy considering going back? Have you had any occasions where you felt the interaction with the tailor was a bit off but saw so many good points in the end result that you decided to give that tailor another go? In fairness my issue might not have been contempt on the part of the cutter but might have been a genuine administrative or communication error within the operation. Still bad customer service but maybe not as troubling regarding any future relationship. This makes me think that maybe an idea to put on your probably huge list of ideas for future articles might be a piece focusing solely on the relationship between client and tailor, what to do and what not to do, signs that it’s good, bad or a work in progress, etc. Thanks Julian. No, I don’t think it’s crazy. Just be completely honest about what you felt with the previous experience (always very hard to do) and explain that you’d like to develop a long-term relationship if you can get everything right. That long-term relationship is crucial to the way the business model works for tailors, so it’s worth mentioning. Great looking suit. Trousers whilst slightly long look perfect on the waist without the need for braces. Turn ups also add to the look something i would not have expected on a linen suit & with the extra weight will help keep the trouser shape. which colour of shoes would you suggest with a dark brown linen suit ? I do not like brown on brown and I would not dislike black shoes with dark brown suit. What would you suggest ? It’s tricky. Depending on the brown of the linen, I would go for a very dark brown shoe (needs to be enough contrast) or black. Keep a look out for tomorrow’s post on my Dalcuore suit. That is dark brown and is worn with black shoes. Hello Simon! The right place for this question might have been after the video on how to press a suit jacket, but as this post is about a linen suit, therefor im asking it here. Beside the common suggestion of leaving a linen jacket in the bathroom full of steam, is there are other guidelines on how to take care of a linen jacket in domestic conditions (on what to do/not to do) to keep it crisp (my general interest is in ironing a linen jacket – what should one keep in mind)? Thanks! Am I correct in assuming that Dege has a rather military style? Can I ask how the price and quality of construction/make compares to other SR tailors in your opinion? Thanks for the Article Simon. Despite some arguments seem to be missing in your criticism against spanish tailoring. You speak about issues and problems with the sleeveheads and shoulders of both suits made with Spanish tailor, but it seems you are not really able to explain or give details about this issues. Sincerely, I usually like your articles because you give your sincere and argumentee opinion. With cons and pros. But here, all the article seems like a “Brexit” article, clearly trying to place english tailoring above others giving as only argument to show interest in spanish tailoring the Price and “cheap suits” point. Well hope this is not caused because English tailors in your country are pushing you hard to stop defending and commenting good works made in other countries that have a cheaper tailoring, and in my opinion, a best one in this particular case. Just need to compare the pictures of lining suit made in Langa to realise that lapels, curves, forms are more beautiful and actual. This cut is also nice but seems “old” long jacket with lack of forms and curves. But its just an opinion of course. Thanks Enrique. First point – I voted to remain in the EU, as did everyone I know! And I’m afraid I’m not criticising Spanish tailors, as Calvo de Mora were superb, and I have consistently said they are superb. I have also praised a lot of Italian and French tailors. So I’m afraid it is just about Langa and Reillo, but I’m happy to do more information on them at some point if people want. Glad to realise i was wrong interpreting your article. So it’s positive to make the point, because the issue about the “cheap” Spanish suits , prices and troubles with shoulders sounded like a general comment concerning Spanish Tailoring and its skills (about which you have written nice articles in the past too). So thanks again for your kind reply and also thanks for voting Remain! No matter what referendums tell, we’ll still be enjoying and sharing sartorial knowledges and experiencies around Europe together for sure. I#m going to let the local tailor produce a summer suit for me and I’m very fascinated of your two tobacco linen suits. On the pictures the one from Langa it has the perfect colour for me. This thicker one seems to have a yellow touch. Do you know more linen/summer fabrics, that have the same colour like the scabal fabric and are thicker?